subroutine Do X net damage. A sentry with four strength and two subroutines is pretty good. It can't be easily broken by Mimic. Even an Eater has to pay four credits to get through it. But is it good enough to be worth paying eight credits for? You don't see a lot of Wall of Thorns or Tollbooth around, so I suspect that this won't get played "just cause". On the other hand, since this has the NEXT subtype, it can make your other ice stronger, so that might push it over the edge. Or, you can plan to actually make the subroutines fire. 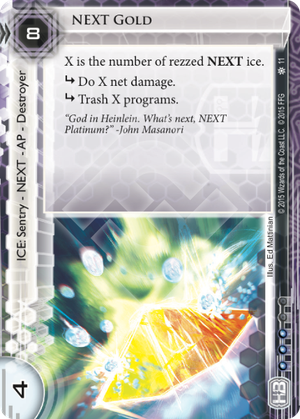 You'll probably have a bit of other NEXT ice out to make X high enough to do some serious damage, but if you're having trouble finding or rezzing it, you can try Levy University, The Foundry: Refining the Process, Executive Retreat etc. The next step is figuring out how to stop the runner breaking the subroutines. Inazuma is cool, though it can be broken. Corporate Troubleshooter is probably your best choice. If the runner has an efficient breaker like Sharpshooter, you will need twice as many credits as the runner to stop them from breaking it though. I also saw an upcoming card where the runner can either run a central server of your choice during your turn, or else you get some other benefit. That card could be used to goad the runner into hitting a NEXT Gold when they're not set up for it. A great add to next decks, helping others, while being a fair blowout card if it lands. The splash is goofy, but fine, since HB will only run the others anyway. I like it in Foundry where you can ABT it easier. Also with EBC and AIZ, the rez isn't so bad, and at 4 it trolls mimic only builds like calim kate, or some criminals. 4 str is quite a good spot for sentries these days. The only downside is the ridiculous rez cost. Also, calling it now, next plat is going to be a unique mythic. Stretching for subs, maybe cannot make another run and etr, with lower cost than Gold. Also flavor text by John M. Something to the effect of "Didn't see that coming" or something like that.